Bad Axe Throwing is gearing up to open doors in Dallas on Friday June 8th with our Free Open House Dallas! 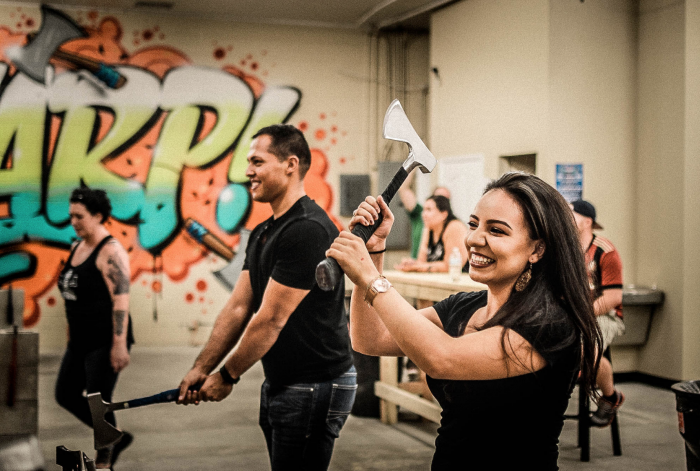 Chucking steel blades at wooden targets isn’t a lumberjack’s pastime anymore–urban axe throwing is America’s favourite way to celebrate any occasion and now Dallas will have their own indoor axe throwing facility! We’re opening up our doors for the totally awesome & amazing people of Dallas and surrounding areas to come and see what all this axe throwing awesomeness is all about! The best part is that it’s totally FREE! If you have been dying to try out axe throwing, our Free Open House Dallas is your chance! Share the exciting news with your friends, invite them in. Come one, come all! We’re located right next to Tenison Park Golf Course at 5438 E. Grand Avenue. BBC Visits Bad Axe Throwing in Washington D.C.